Have you ever wondered why some people’s eyes seem to twinkle while others seem a little dull and lifeless? Apparently, the twinkle in your eyes comes from Hyaluronic acid. As we age, the hyaluronic acid in your eye tends to decrease, hence giving your eyes the dullness. In order to keep your eyes nice and moisturized, and give it that little extra twinkle at that, there are many eye drops that includes hyaluronic acid to make your eyes shine again. 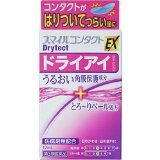 However, please note that as a general rule in Japan, off shelf eye drops aren’t allow to have hyaluronic acid as their main component, hence if there are no signs of improvements of your dry eyes, it is recommended that you go see a doctor instantly. 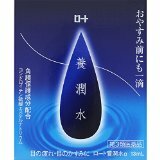 This is one of my favorite Made in Japan eye drops. Unlike most of the other eye drops for dry eyes, it is recommended that you use this eye drop every night before you go to bed. The good thing about this eye drop is that it helps speed up the recovery of dry eyes due to use of contact lens and over exposure to the computer screen during your sleeping hours. Of course, you can always use it during the day as well, but it is most effect before you head to bed. I’ve never tried using this eye drop medication before, mainly because I don’t wear contact lens. However, I do have a few friends who strongly recommended this eye drop. 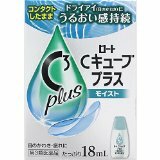 It is an eye drop that can be used of all types of contact lens, even people without contact lens can use this eye drop. That is why it is said to be the easiest to use out of all the eye drops for dry eyes. Just one drop and your dried eyes will feel cool and refreshed. Again, I do not wear contact lens hence I can’t speak from experience. However, I’ve heard that this eye drop works the best for those with dry eyes and wear contact lens because it wraps itself perfectly with the shape of the contact lens and keeps your eyes nice and moisturized.